For these pages, ostensibly focussed on sculpture more than architecture, and especially 19th and early 20th century sculpture rather than earlier work, to drift to a biography of Wren may seem a drift too far. Nevertheless, given the information on City Churches, a bit on Wren may be excused. 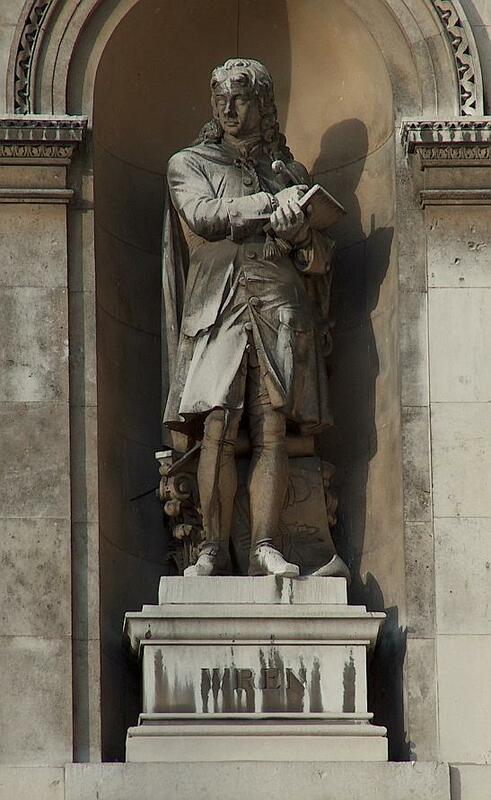 His portrait statue, above, is on the facade of Burlington House, and is by the sculptor E. B. Stephens. Christopher Wren was born in Wiltshire in 1632, and came from a High Church background, his father becoming Dean of Windsor, and Matthew Wren, his uncle, Bishop of Ely. He seems to have been something of a polymath, and his early flair was in maths (Newton was said to have been particularly impressed with his experiments in geometry) and the sciences, including anatomy and astronomy. At a young age he became a Professor of Astronomy, first in London, then in Oxford. However, in 1663 he was appointed to the commission charged with restoring old St Paul’s Cathedral, and after the Fire of London he became first an assistant to the Surveyor General and then Surveyor General of the King’s Works – i.e. the nation’s chief architect – himself, and won his knighthood. His earliest architectural works, then, date from the 1660s, with Oxford’s Sheldonian Theatre, and Cambridge’s Pembroke College Chapel. He went on his only trip abroad for some months in 1665-6 to France, and possibly Holland and Flanders, and the main influences on his work are thus French and Dutch rather than Italian. He had some further work in Oxford and Cambridge, including the Tom Tower for Christ Church in the former, and work for Emmanuel and Trinity Colleges in the latter. Among secular buildings we must at least mention Greenwich Hospital, with its Painted Hall by Thornhill, some work on Hampton Court, and Marlborough House in London, since much altered. Moving to the City, Temple Bar (1670) is his, and of course the Monument to the Great Fire (built 1671), as well as various City Livery Company halls lost in WW2 bombing. However, our interest here is Wren’s churches. His rebuilding of St Paul’s lasted from 1675 through to 1710, an astonishing feat compared to the time taken to build most of the great Cathedrals. And throughout much of this period (1670-86) he was also designing the City Churches, over 50 in all. What can we say in general about these? Firstly, unlike St Paul’s, most of them were on cramped sites, hemmed in by other buildings, or even if their surroundings were exposed by the Fire, likely to be soon hemmed in again. This means that Wren’s City Churches typically show their variety and decorative interest much more in the interiors and in the spires than in the exterior walls. St Paul’s imprints itself so much on our minds that we readily presume that all his churches would be classical baroque. His style was indeed Roman classical, indeed only Inigo Jones before him had made numbers of classical churches. However, a very few Wren City Churches are Gothic, because of a wish to rebuild or recreate the style of the previous building on the site. These rare 'Gothic Wrens' include St Michael Cornhill, St Mary Aldermary, St Dunstan’s in the East, of which only Wren’s tower remains, and the bombed to smithereens St Alban's Wood Street where only the tower survives. The churches are generally on the sites of burnt down pre-Fire churches, and this means that sometimes the shapes are unusual, with walls often not being quite at right angles so that existing foundations could be reused, and also on occasion Wren used existing surviving walls or towers. But Wren was not aiming for the long naves and aisles for Catholic processions that often guided the shapes of pre-Fire churches, but was building Protestant churches, where a large central space better suited the wish for the whole congregation to be able to see the preacher and the altar. So a fair proportion of his churches are either domed, or consist of a nave with two side aisles divided by pillars, though there are examples of rectangular or Greek cross-shapes too. Wren’s favoured building material was hard Portland Stone, and most of the City Churches are of such, and have worn well. His other material was red brick, exemplified by St Benet’s Upper Thames Street (St Benet's Welsh Church). 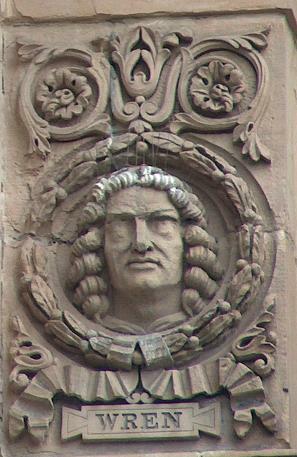 He tended to favour the same builders and craftsmen for many of his churches, and of particular interest to these pages, they included Grinling Gibbons, wood-carver and also occasional sculptor in stone, who is responsible for many of the carved reredoses, pulpits and altar-pieces in Wren churches, and Benjamin West, the painter. In terms of what has survived, out of about 53 Wren City Churches in all (the number is quoted differently by different sources because a couple built under his supervision are thought to be more or less entirely the work of his assistants, for example I do not count St Mary Woolnoth, by Hawksmoor), something like a third had been demolished or rebuilt by the 20th century. The Second World War devastated many of the remainder, and Sacheverell Sitwell, writing during the war, wrote that ‘Of Wren’s 50 City churches it is difficult, indeed, to know what is standing and what has been destroyed.’ Nevertheless, we have left a variety of Wren originals, damaged churches which have been carefully restored, and demolished churches where the imaginative towers and spires survive. The best-known Wren Spire, St Brides.